Rising from the shores of Lake Chatuge to the heights of Tusquittee Bald, Clay County NC is considered one of the unspoiled hideaways of the Blue Ridge Mountains. Mountain trails weave through tall hardwood timber forest dissected by crystal clear creeks and streams making this region a natural mountain experience for all visitors. It's ideal small town communities have become a natural haven to the creative minds of artists looking for a place to express the gifts of their imagination. Looking up from the numerous valley floors of Clay County to the mountain vistas alone are enough to inspire one's passions. The mountains return the favor along the western slopes of Chunky Gal Mountain where there are two overlooks along HWY 64 that view back down into the valley below. North Carolina's Nantahala National Forest borders the north, east and western portions of Clay County. One of the enormous mountain ranges to the south of the overlook are capped by both the Hightower Bald and the top of Eagle Mountain displaying a steep elevated perspective of these ancient mountains, making all else within sight, appear small and insignificant. The southern region of Clay County is largely dominated by the northern shoreline of Lake Chatuge , which expands itself southward into North Georgia's Towns County and the mountains of the Chattahoochee National Forest. Lake Chatuge is by far one of the most picturesque mountain lakes throughout the Blue Ridge Smoky Mountains. Much of the shoreline is dotted with both vacation and full time residents. The crystal blue waters of Lake Chatuge are ideal for fishing and boating with several campgrounds and beaches along its extensive shores. Numerous creeks and tributaries feed Lake Chatuge, even though it lies along the bed of its main source, the Hiwassee River. Hiwassee River finds its headwaters in the southern reaches of Georgia's Towns County in the High Shoals watershed area. From the lake, the river re-emerges at Hiwassee Dam in Clay County cutting a northwestern path along its natural course, making its way through western North Carolina and into the Tennessee River Valley. The river's bank weave across the valley floor with exceptional views throughout the county especially along Fires Creek Road. 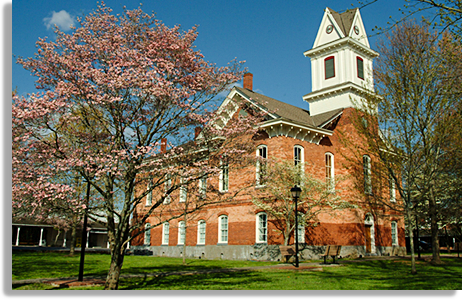 The heart of Clay County is home to the town of Hayesville, the County Seat. This ideal mountain town sets upon a hilltop and is centered by a town square which supports several large trees, cobble stone sidewalks, a historic courthouse and a large gazebo on its southeastern corner. The square is the site of several of the county events and festivals, offering a fine example of what a classic quaint mountain town should be like. Surrounding the town square are its four main streets comprised of modest wooden structured store-fronts and a few brick buildings. Porch covered sidewalks extend off certain sections of this shopping and dining district, offering a unique sense of 'the good old days' when times were simpler and mountain ways were both slow and easy on a warm summer night. The historic reddish-orange brick Courthouse adorns the square like a natural icon of the county's early history. Completed in 1889 the historic courthouse is an example of Vernacular Italianate architecture and is listed on the National Registry of Historic Building. The historic courthouse is no longer used as a seat of government. The community has proposed several possible uses for the cherished structure, yet to date nothing has been officially decided. Clay County, which was officially incorporated in 1861 has a new courthouse located on the edge of town. Setting upon a rising field with a mountainous backdrop adding a commanding presence to the newly constructed Clay County Courthouse. One block away from the town square is the Old Jail Museum. Constructed in 1912 and in use as a lock up until 1972, this historic museum offers exhibits of old relics and artifacts reflecting the early life of Clay County residents as well as features of the old jail-house itself. Situated next-door to the museum is the Cherokee Homestead Outdoor Exhibit displaying a modest, full scale 16th to 18th century replica of a Cherokee Village. Clay County is also known as an artisan community for both newly arrived artist as well as local mountain folk artist both enjoying and sharing a creative mountain environment. Spread throughout the county are several artist studios, yet the main and premier artisan community lies on the edge of a modest little town known as Brasstown, located along the southwestern edge of Clay County near the convergence of the Hiwassee River and Brasstown Creek. This little one street town is along the edge of the John C. Campbell Folk School. The folk school was established in 1925 and is renowned for its folk art, folk dancing and other creative arts. It is quite and experience in itself. The folk school is situated within 300-plus acre campus, which consist of both rustic historic buildings and newer structures designed to harmoniously blend to its natural mountain setting. The largest far western North Carolina fall festival of the year called the John C. Campbell Fall Festival is held on the grounds of the campus drawing thousands of visitors for the sole purpose of enjoying mountain arts, music, dancing and mountain delectables. For more insight into the folk school click on our Blue Ridge Highlander Magazine section for stories and information about the folk school. The Brasstown and Brasstown Creek region of Clay County are only one of several picturesque mountain communities throughout the county. There's also the Fires Creek district that rest along the northern bank of the Hiwassee River and is cradled below the northern boundary by the Valley River and Tusquittee Mountain Ranges. Access to the Fires Creek Recreation area is located off Fires Creek Road and marked by a Forestry Entrance signage. The facilities at the Fires Creek Recreation area offer both long and short trails, a waterfall, and parking area along the cascading waters of Fires Creek, plus a well place restroom privy. An arched-bridge crossing Fires Creek accesses the area's trail-heads for day hikers. The old logging road that leads into the Fires Creek Recreation Area continues on past the recreation area, traveling higher and deeper into a vast mountain cove within this section of the Nantahala National Forest. This forestry road is well maintained, yet access to a turn around is scarce. Another beautiful Clay County Community is the Shooting Creek area, located in the southeastern region of the county. This most picturesque rural area is made up of valley lands accented by enormous mountain ranges. The mountains to the north are a part of the Nantahala National Forest and to the south of the Shooting Creek community are the mountains of both the Nantahala National Forest and the larger mountain range behind are those of North Georgia's Chattahoochee National Forest. Tusquittee Valley located north of the town Hayesville is likely the most beautiful of the three. Enclosed by high mountain ranges and dissected through its center by the Tusquittee Creek, Tusquittee Valley is by far something quite unique. Most certainly this mountain valley is a prize-winning photo opportunity at every turn. A mostly residential community this quiet serene mountain valley is revered by both its residents and regional mountain neighbors as well as visitors the Clay County. 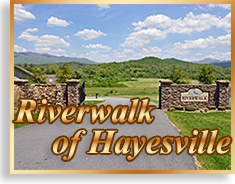 Experience a new way of life at Riverwalk of Hayesville, a gated community with beautiful mountain views. Riverwalk is located within walking distance of beautiful downtown Hayesville NC. In addition to the surroundings, the amenities of building a home in Riverwalk of Hayesville are immense, and with all exterior maintenance taken care of, you'll have more time to relax and enjoy your life. You can even take a stroll on the walking paths at Riverwalk.